Level 1 - Initiation Level 1 is the introduction of the basic skills in hockey of skating, puck handling, passing, receiving and shooting. The primary role in the Initiation Program is instructing the basic skills of hockey to beginners. Topics covered include leadership qualities, communication, teaching skill progression and skill analysis. Four teaching progression practice plan manuals are provided to each coach attending the clinic. Cost is $25 and on-line registration is requested, clinic is a full day with an ice session. Gloves, helmet, stick and skates are required. Level 1 Clinics are scheduled at the State level. Level 2 - Associate The Level 2 clinic invovles the study of coaching skills such as the role of the coach, teaching techniques and practice organization; individual player skills such as skating, puck control, shooting, body play, goaltending and team development related to the basic concepts of offensive and defensive team play. 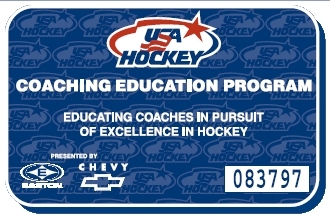 The program also utilizes a workbook based on teh Level 2 Coaching Manuals. Cost is $35 and on-line registration is requested, clinic is a full day with an ice session. Gloves, helmet, stick and skates are required. Level 2 Clinics are scheduled at the State level. Level 3 - Intermediate The Level 3 clinic involves the study of coaching psychology and physiology as they relate to hockey. Player development skills include body checking, over-speed skating and dryland training. Discussion will take place on team concepts and systems which include defensive, offensive and specialty situations. Cost is $45 and on-line registration is requested, clinic is a full day with an ice session. Gloves, helmet, stick and skates are required. Level 3 Clinics are scheduled at the State level. Level 4 - Advanced The Level 4 clinic examines in great depth the psychological, motivational and teaching aspects of coaching young athletes, along with the physiological and conditioning requirements of training ice hockey players. It will also deal in-depth with more complex tactics and systems and advanced levels of player skills and development. Cost is $150-$300 and on-line registration is requested, clinic is held over a weekend. Level 4 Clinics are scheduled at the District level. Level 5 - Master The Level 5 symposium examines in great depth the physiological aspects of coaching young athletes. It also will take a more in-depth look at sytems of team play and player skill development at the international level. Daily small group breakout sessions occur with an assigned leader that address present day hockey issues. Cost varies with venue and on-line registration is requested, the National Coaches Symposium is held during the week and is scheduled at the National level. At your first clinic you'll receive a Blue CEP Card. Each time you take a CEP Clinic or approved workshop then you'll receive a sticker to place on the back of your card. That sticker will indicate the Level and the season in which the clinic was taken. Click Here if you've lost your CEP Card.